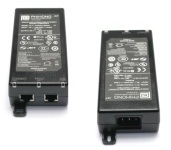 Simply connect your Power-over-Ethernet camera to one port and your vision processor or PC to the other port. LED status indicators show power, fault, and connect status. See link below for complete specifications and dimensions. Protection The output is equipped with short-circuit protection and overload protection as per the IEEE 802.3af specification and conforms to UL60950-2. The output can be shorted permanently without damage. Connect camera to the "Out" port and computer to the "In" port.